Whever a new student enrolls for lessons my first question is; "How long do you intend to play guitar for?" Many look at me with a half smile as if I am asking a trick question and hesitantly reply with "Forever I guess". The reason I ask this question is not so much for my information because almost everyone who takes up guitar does so with the idea of playing for the rest of their life but I just want to make a point as I will explain below. Everyday I speak to people who 'want' to learn guitar. Some have decided they are no longer going to ponder the idea and instead take action. When adults enroll to learn guitar they will often say how they wanted to learn when they were younger but kept putting it off for one reason or another. Guitar really is a lifelong love affair and anything less is probably a waste of time. I have been playing guitar for almost 30 years and apart from the first few years when it seemed all too hard I have never considered stopping even when it felt like I had no time for practice. There were times due to injury where I could not play for one reason or another but I was certainly thinking about it. So my point in the question from above is this: When students learn guitar the early years are difficult and most feel a growing impatience when their progress is slow. My question "How long do you intend to play guitar for?" allows me to point out that 2 years of dedication and consistent practice is a small price to pay for a lifetime of guitar bliss. The learning of course doesn't stop after 2 years but I have found that the first few years are the make or break. As a rough estimate I would say those who get to the 2 year mark have about a 90% chance of sticking to guitar for life compared to those in their first 6 months who have less than a 50% chance. (Please note that a good teacher/coach can make a difference). My question helps to put this into perspective and helps to change their focus. Don't expect too much too soon is my message especially if you have signed up for life. 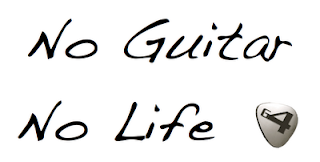 If you desire to play guitar your desire will most likely be with you for life whether you act on it or not. My advice is not to make excuses as to why you don't have the time because you will never have the time. You need to make time. Still I am yet to meet someone who really doesn't have the time. Its about priorities. If playing guitar is in your top 5 then you need start learning today. Not tomorrow or next week or after your second cousin's wife's 30th birthday party but NOW! Turn off the TV or computer, leave work 30 minutes early, forget the hour lunch break, get up a little earlier. Do whatever it takes because tomorrow there will be another excuse.